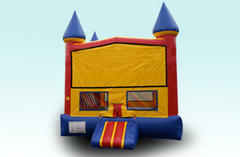 This 2n1 Bounce House Rental is unisex and offers a spacious bounce area as well as a basket ball hoop and saftey ramp. You can also add a banner with a theme to the front of this bounce house or leave it plain. This bounce house is perfect for any event large or small. The large bounce area provides plenty of room for your children to jump, bounce and run for hours on end. Don't forget to look at our Concessions.